Time to have your heating unit inspected. 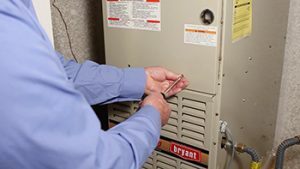 An annual maintenance of your heating unit is always recommended and these are the three major reasons why. Longevity –Like a vehicle, routine maintenance has been proven time over time, to lengthen the life of your vehicle and make sure that the proper protocol is followed for warranty purposes. Same goes with your heating and cooling equipment. Proper refrigerant levels, gas pressures, etc. allow a unit to operate at peak efficiency which will allow the equipment to last much longer. Air Quality – Dirty filters increase energy usage and result in more service calls than any other issue. A clean filter or properly operating air cleaner will ensure proper airflow through the equipment and throughout the home, resulting in a more evenly heated home. We check each system’s filter to ensure your indoor air quality and comfort levels are optimum, as well as making sure the system has the right amount of air to run as it is intended.